Christmas trees are festive (and smell great, we know) but they're also not very eco-friendly. Still, if you want a real Christmas tree, you're not alone. According to the Environmental Protection Agency (EPA) about 33 million real Christmas trees are sold in the USA every year. Sadly, these sales take their toll on the environment. For example, did you know that just one acre of living Christmas trees can provide daily oxygen for 18 people and that just one farmed tree absorbs more than 1 ton of CO2 throughout its lifespan? Additionally, most real Christmas trees are grown with pesticides that are toxic to wildlife and people. Artificial Christmas trees are arguably worse, because 80% of them are manufactured in China and most contain harmful materials like PVC, lead and other plastics, which beyond being a health hazard, never biodegrade. So, what's a savvy green family to do? Why not try an alternative Christmas tree this year. For example, we love the paper snowflake tree shown above. You could make your own paper snowflakes with the kids for this lovely white tree or purchase ready-made snowflakes instead. 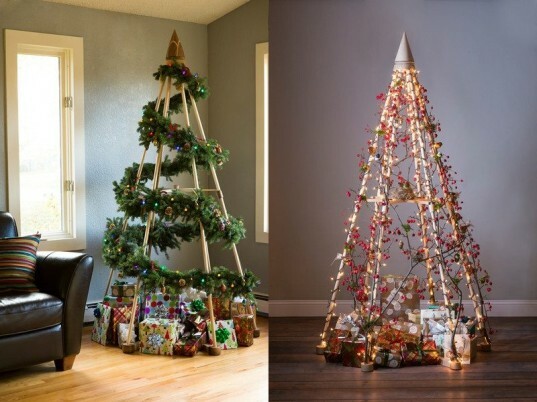 Read on for 20 more DIY and faux Christmas tree ideas. 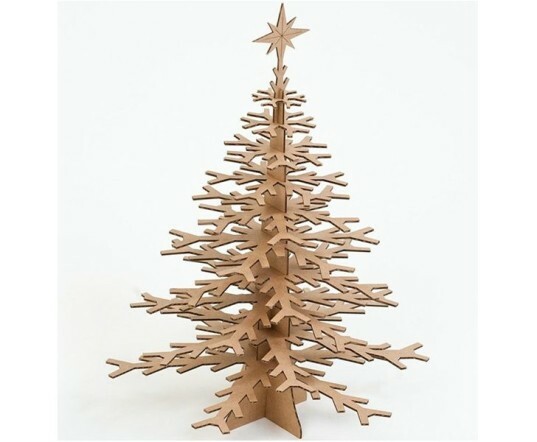 The Snowflake Tree by Cardboard Safari is a perfect addition to a home or office holiday setting. The lovely laser-cut modern design by Luis Rodrigalvarez looks great plain or can be decorated with paint, glitter, wrapping paper or other craft materials. 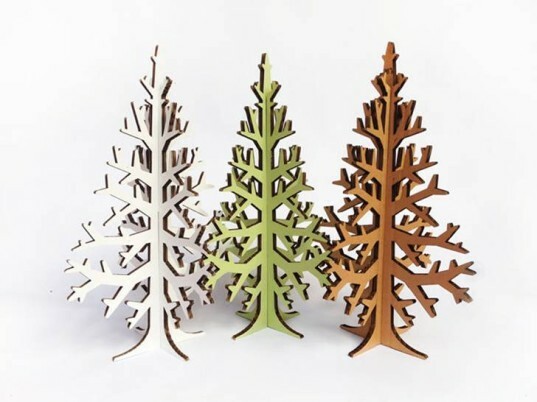 Each decorative tree is made of recycled cardboard and flat-packed for easy shipping. Also check out their Alpine Tree. This gorgeous chalkboard style Christmas tree by Oakdene Designs is perfect for shabby chic and vintage inspired Christmas interiors. 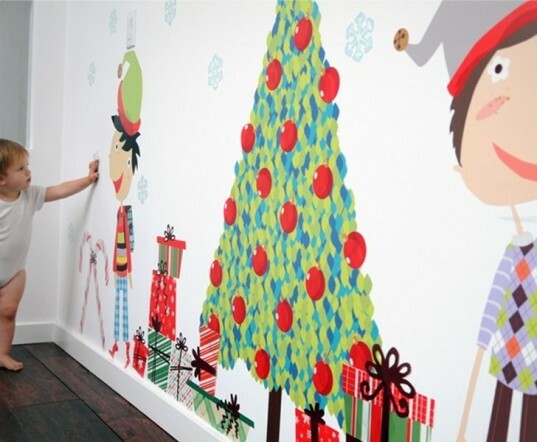 The tree, printed onto self-adhesive wallpaper is easily applied, quickly removed and can be re-applied the following Christmas. Printed with solvent free pigment inks onto a special crease proof fabric with a self-adhesive backing. 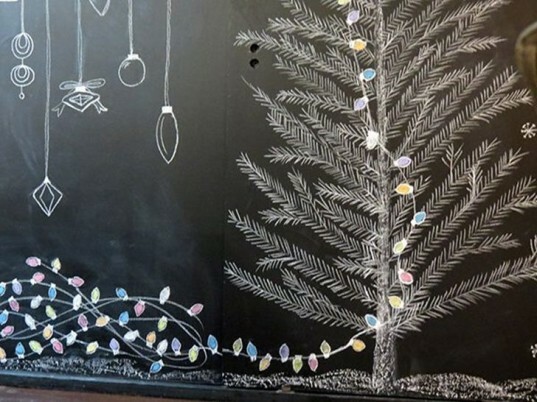 If you want a chalkboard tree but would rather go freestyle vs. a premade self-adhesive wall sticker, it’s easy if you already have a blackboard wall. If you don’t, some chalkboard paint will fix you right up. If you need some inspiration or aren’t much of an artist, see this cool FREE printable chalkboard Christmas tree pattern. The Jubiltree Wooden Tree sold out in 2013 and it’s no wonder. 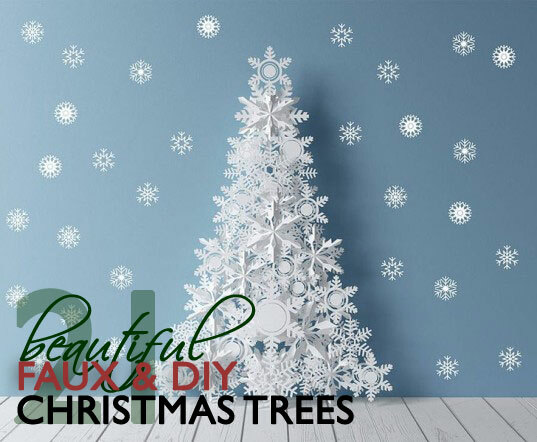 This beautiful Christmas tree option is a tree-sized frame that can be decorated any way you like for the holiday season, whether you’re looking for a modern Christmas tree or something more traditional. The wooden frame of each classic tree is hand-crafted in Maine from solid U.S. maple and the Artisan Tree is crafted in cherry. Easily assembled, this tree allows your family’s creative side to shine and a handy storage box is included. 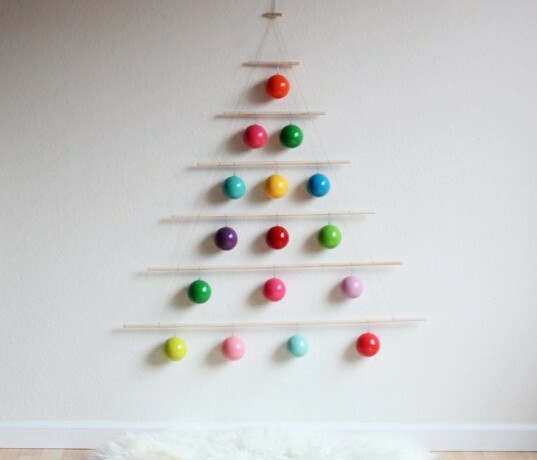 This hip DIY wooden dowel Christmas tree is perfect if you’ve got limited space or a craving for something modern, bright and totally unique. The Massimo tree is made of 100% recycled cardboard, yet combines modernity and tradition. Various models are available and a set of multi-colored or red LED lights is included with the tree. Timbatree is ideal for any home and comes in sizes that will even fit a small apartment. 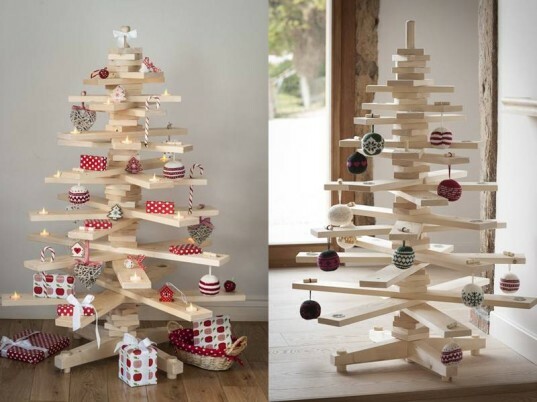 Timbatree is designed and handmade in Britain by carpenter Joost Taylor, using FSC certified redwood sourced from Scandinavian forests and comes packaged in a recycled cardboard box. No needles, screws or nails are needed to put this tree together -just a few quick clicks and your tree is ready to dress. If you’re looking for a tree with some color, you can add one of nine Chalk Paint decorative paints by Annie Sloan to your purchase. 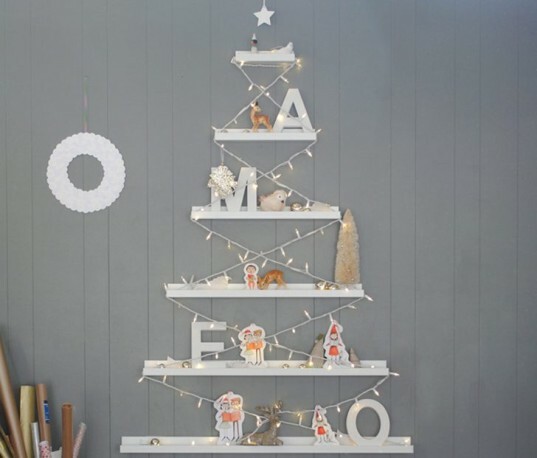 This adorable and unique Christmas tree option, made with shelving is simple and quick to make and can be decorated with modern or traditional style. If you’ve recently had a party that involved honeycombs as part of the decor scheme, you can put those honeycombs to good use and build a clever holiday tree. Make it colorful as shown above or use more traditional holiday shades of red and greens. No room for a large, wide alternative Christmas tree? No worries. Martha has you covered with this cool modern tree made of basic items you can pick up at any home supply store. Once made, the tree is less than six inches deep and can hang on or lean against a wall. 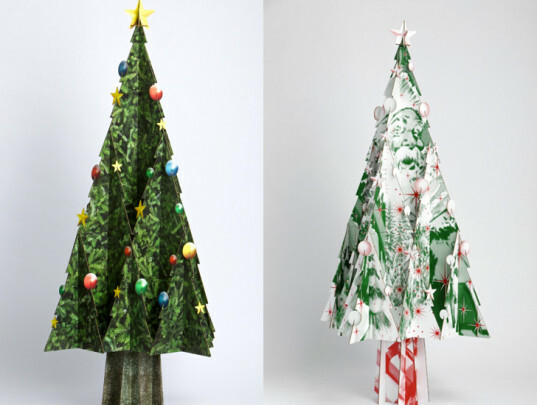 We’re already fans of Makedo so it’s just a bonus that you can use your set to make a cool recycled Christmas tree. You can paint or decorate your tree as you see fit and even add lights. Each possibiliTree is hand crafted in Minnesota from a variety of natural wood species including: wild cherry, walnut, birch and reclaimed deadwood. 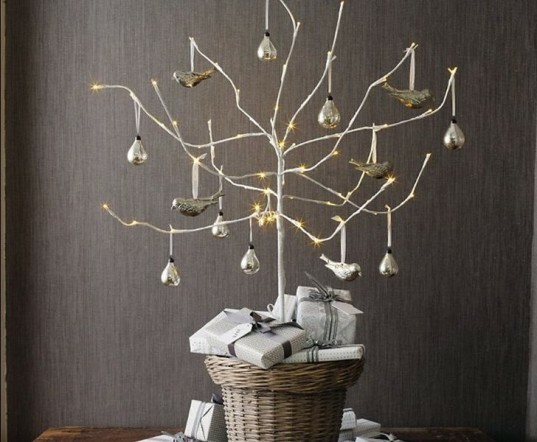 The tree features slatted branches that fan out from a center rod creating endless decorating possibilities. You can get this alternative Christmas tree in a full size, 6 foot version or for smaller spaces go with the 2 or 3 foot tabletop styles. If you really don’t want the hassle of decorating any tree, but still want that holiday feel in your home, then Pop & Lolli’s holiday fabric wall decor might be just the thing. The colorful Pop & Lolli’s Jingle Bells and Christmas smells fabric wall stickers set includes 72 fabric stickers: 11 Glittery Gifts, 5 Cute Candy Canes, 5 Jingly Hats, 1 Fresh Christmas Tree, 20 Sparkling Ornaments, 4 Big Bows, 2 Flashy Light Strings, and 24 Soft Snow Flakes. The wall stickers are made in the USA, plus they’re 100% removable, reusable and repositionable. This awesome bright and shiny tree goes up in no time flat, yet looks surprisingly chic and modern. We love the twinkling white lights, but go ahead and use colored lights if you want even more holiday color in your house. Just be sure to use eco-friendly LED Christmas lights. 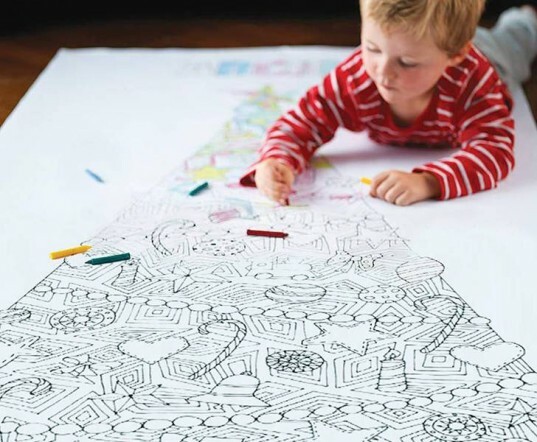 For hours of entertainment and great fun for kids you can’t go wrong with a life-sized Christmas tree coloring poster. Bonus, this fun poster can be personalized, with names or other expressions of holiday cheer you may want to spread. The poster is printed in black on high quality matte un-coated paper stock and arrives packaged in a tube ready to display and use. Still got junk mail or a stack of old books, magazines or other paper? Don’t recycle it yet, because you can design a cool holiday tree out of it in just five easy steps. 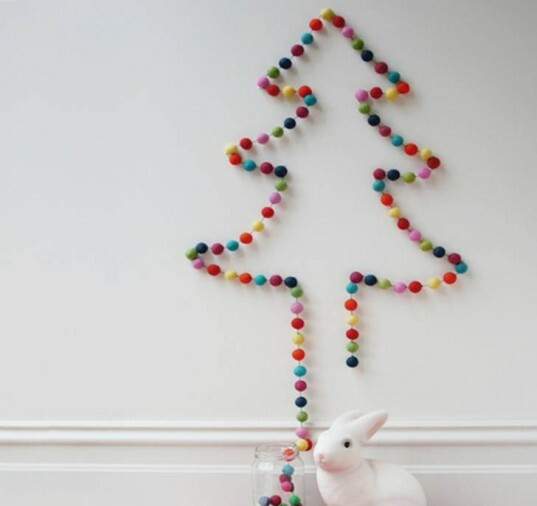 This minimalist wool pom pom Christmas tree adds a splash of color and it’s wonderfully unique and fun. Wool balls, or poms, and even ready made pom garlands are available at most craft stores, or you can check out the selection of wool poms at Etsy. Pallet Christmas trees are all the rage, but the sweet and stylish pallet-style tree above may be one of the easiest we’ve seen. This basic cardboard Christmas tree is made of 100% natural recycled cardboard and comes in 6 pieces that store flat and easily under the bed when the season is over. The colored trees are hand-painted with natural non-allergic paint. 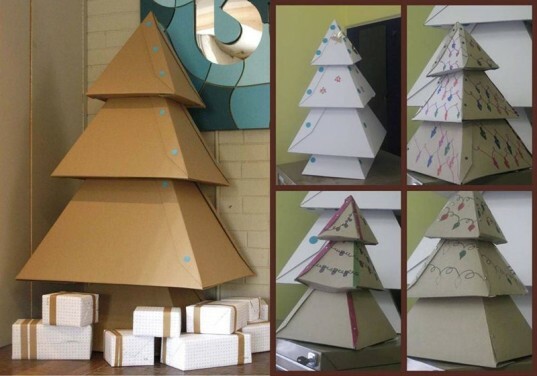 No matter which cardboard tree you pick, you can add electric lights and any decorations you’d like. 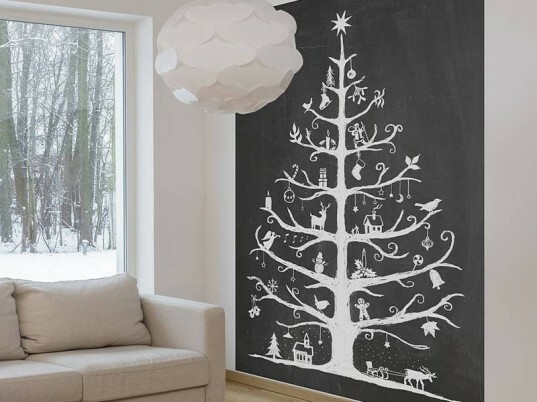 If you want a chalkboard tree but would rather go freestyle vs. a premade self-adhesive wall sticker, it's easy if you already have a blackboard wall. If you don't, some chalkboard paint will fix you right up. If you need some inspiration or aren't much of an artist, see this cool FREE printable chalkboard Christmas tree pattern. The Jubiltree Wooden Tree sold out in 2013 and it's no wonder. This beautiful Christmas tree option is a tree-sized frame that can be decorated any way you like for the holiday season, whether you're looking for a modern Christmas tree or something more traditional. The wooden frame of each classic tree is hand-crafted in Maine from solid U.S. maple and the Artisan Tree is crafted in cherry. Easily assembled, this tree allows your family's creative side to shine and a handy storage box is included. 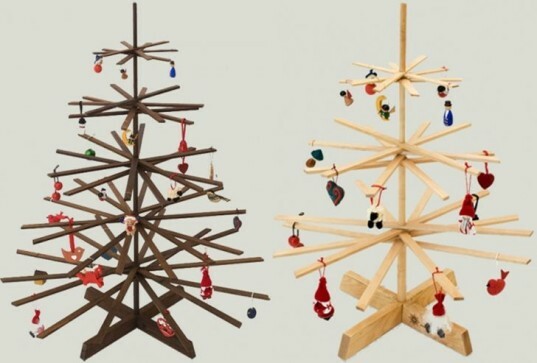 This hip DIY wooden dowel Christmas tree is perfect if you've got limited space or a craving for something modern, bright and totally unique. Timbatree is ideal for any home and comes in sizes that will even fit a small apartment. Timbatree is designed and handmade in Britain by carpenter Joost Taylor, using FSC certified redwood sourced from Scandinavian forests and comes packaged in a recycled cardboard box. No needles, screws or nails are needed to put this tree together -just a few quick clicks and your tree is ready to dress. If you're looking for a tree with some color, you can add one of nine Chalk Paint decorative paints by Annie Sloan to your purchase. If you've recently had a party that involved honeycombs as part of the decor scheme, you can put those honeycombs to good use and build a clever holiday tree. Make it colorful as shown above or use more traditional holiday shades of red and greens. 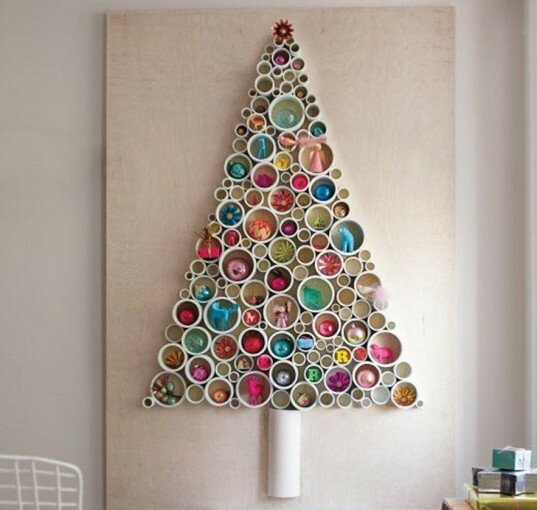 We're already fans of Makedo so it's just a bonus that you can use your set to make a cool recycled Christmas tree. You can paint or decorate your tree as you see fit and even add lights. If you really don't want the hassle of decorating any tree, but still want that holiday feel in your home, then Pop & Lolli's holiday fabric wall decor might be just the thing. The colorful Pop & Lolli’s Jingle Bells and Christmas smells fabric wall stickers set includes 72 fabric stickers: 11 Glittery Gifts, 5 Cute Candy Canes, 5 Jingly Hats, 1 Fresh Christmas Tree, 20 Sparkling Ornaments, 4 Big Bows, 2 Flashy Light Strings, and 24 Soft Snow Flakes. The wall stickers are made in the USA, plus they're 100% removable, reusable and repositionable. Found branches and twigs can be used to create some truly spectacular Christmas tree alternatives, such as the painted branch in the basket shown above. For another fabulous and modern idea check out this twig tree or hit up Pinterest and do a search for "twig Christmas trees." For hours of entertainment and great fun for kids you can't go wrong with a life-sized Christmas tree coloring poster. Bonus, this fun poster can be personalized, with names or other expressions of holiday cheer you may want to spread. The poster is printed in black on high quality matte un-coated paper stock and arrives packaged in a tube ready to display and use. Still got junk mail or a stack of old books, magazines or other paper? Don't recycle it yet, because you can design a cool holiday tree out of it in just five easy steps. 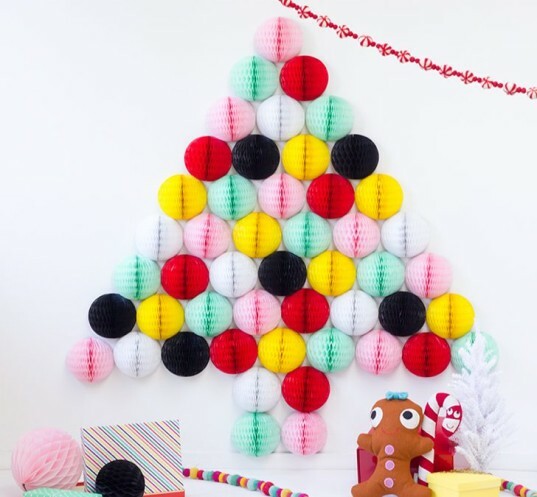 This minimalist wool pom pom Christmas tree adds a splash of color and it's wonderfully unique and fun. Wool balls, or poms, and even ready made pom garlands are available at most craft stores, or you can check out the selection of wool poms at Etsy. 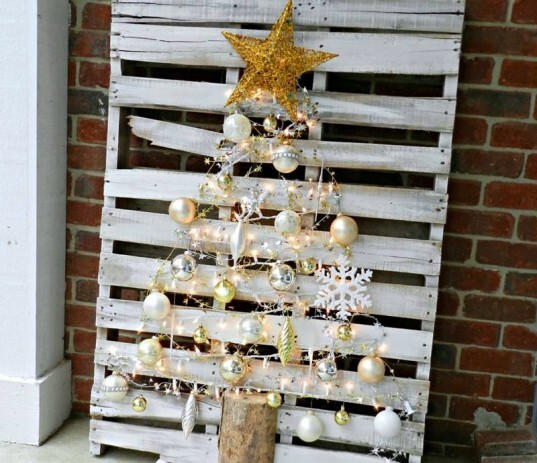 Pallet Christmas trees are all the rage, but the sweet and stylish pallet-style tree above may be one of the easiest we've seen. 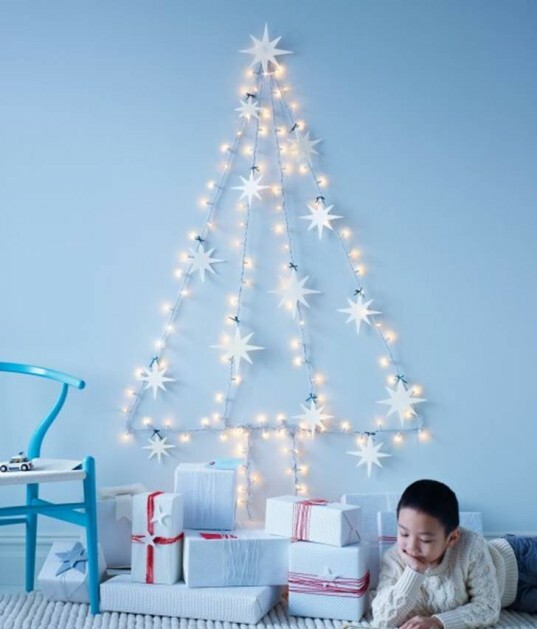 This basic cardboard Christmas tree is made of 100% natural recycled cardboard and comes in 6 pieces that store flat and easily under the bed when the season is over. The colored trees are hand-painted with natural non-allergic paint. 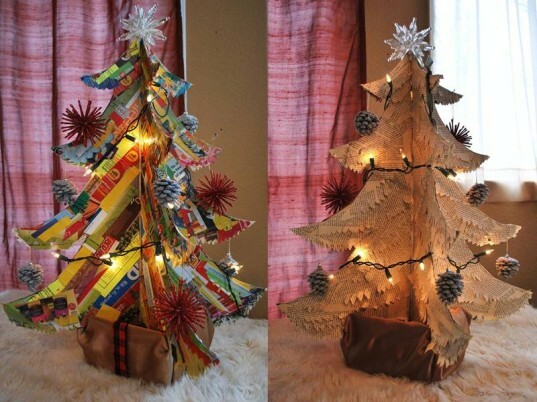 No matter which cardboard tree you pick, you can add electric lights and any decorations you'd like.